Tonight’s first State of Origin match signals the beginning of a series where young Australians will be unnecessarily exposed to mass alcohol advertising. It is shameful that children continue to be exposed to harmful alcohol advertising, as families across the country tune their televisions to live sporting events like the State of Origin games. Allowing our sporting heroes to be walking billboards for alcohol products during prime time viewing encourages children to start drinking at a younger age and at more harmful levels when they reach adulthood. Alcohol advertising has never been as pervasive, as inventive, and as well-resourced as it is now. Alcohol is too often promoted as a product to be enjoyed. A product that will make us feel happy. A product that will help us wind down after a busy week. However, this perception of alcohol hides the real impact it is having on our society. This includes the alcohol-related violence in our streets and homes, right through to alcohol’s contribution to chronic disease and death. This level of harm comes with a significant financial toll, with alcohol costing Australians more than $36 billion a year. Australia should not accept this huge toll and, for the sake of future generations, we cannot ignore it. While the size of the problem is vast, alcohol harm is a preventable problem. The Federal Election this July provides the people of Australia with an opportunity to ensure that their next government takes action to reduce alcohol harms. 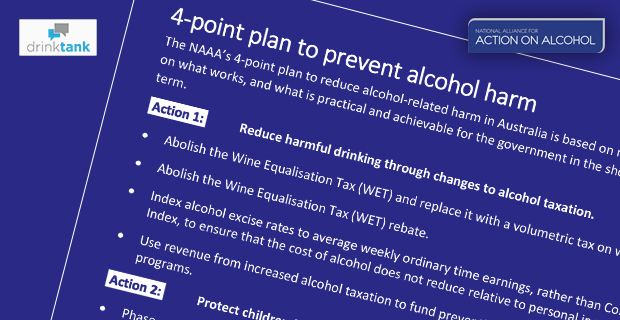 The National Alliance for Action on Alcohol (NAAA) has developed a 4-point plan outlining policy recommendations that are practical, achievable and based on the evidence of what works. NAAA hopes this incisive plan will convince politicians in the upcoming Federal Election to take action in reducing alcohol harms for the benefit of all Australians. One of the four areas identified for immediate action this election is protecting children from alcohol advertising and sponsorship. There is an urgent need for effective regulation that prioritises the health of young people, and supports public health efforts to change Australia’s harmful drinking culture. The Commercial Television Industry Code of Practice was reviewed earlier this year and continued to allow alcohol advertising before 8:30pm during live broadcasts of sporting events. 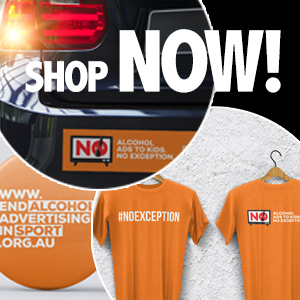 The Australian Government has continuously failed to end the unhealthy link between alcohol sponsorship and sport. And as a result, our children are exposed to an ever increasing rate of alcohol advertising. A recent survey conducted by the Foundation for Alcohol Research and Education (FARE) shows 60 per cent of Australians believe alcohol sponsorship should be banned from sport and 70 per cent believe alcohol advertising should be banned on television before 8:30pm. To date, commercial interests have been prioritised over expert advice and community concerns. It is time for the next Australian Government to step in and acknowledge the failure of self-regulation and the need for legislated controls. A whole-of-system review that considers the effect of alcohol advertising on young people across all mediums is required, and the NAAA is calling for an immediate end to the Code of Practice loophole that allows alcohol advertising during sporting events before 8.30pm. I have had a full on day trying with all my might to find out how to stop Instagram from placing sponsored alcohol adverts in association with the State of Origin game on my 13 year old daughters account. She doesn’t have Facebook so her Instagram is not linked to that. The problem is it is random advertising and it is unable to be controlled or regulated. The ABAC can’t help as it is placement not content, The WA Racing and Gaming Department can’t help either. There is no one to help. Instagram doesn’t reply to any form of contact. I have tried to email the advertiser as advised by their call centre but the email link on their page won’t send the email. I have messaged them on Facebook to no avail. The alcohol industry doesn’t adhere to its own code and when confronted will do what ever they can to “not” admit what they are doing is wrong. I am at my wits end dealing with something that is so out of control it is almost comical! I wonder if in 20 years we will look back on this and ask if it really happened? Did our Government really like spending billions of dollars on alcohol related harms whilst allowing the alcohol industry complete freedom in alcohol advertising and sponsorships? Was this some kind of nasty joke? There absolutely should be an easy way to opt out of alcohol advertising online via google/ Facebook and Instagram. I haven’t found a way to do it yet. Does anyone know? If I’m seeing lots I report it as “not-relevant”.